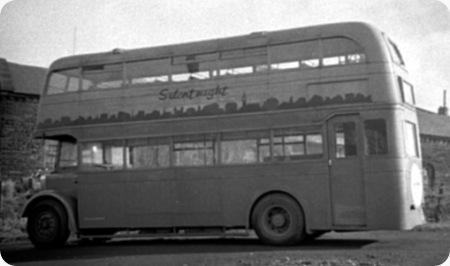 The above shot of the Silentnight (Barnoldswick) works bus appeared for identification on this websites DYK page from John Turner. Pat Jennings did correctly identify it as FCG 526, it was one of nine Leyland PD1s bought new by Basil Williams in 1947 for his Hants and Sussex fleet. FCG 523/4/5 had Northern Coachbuilders H56R bodies, FCG 526/7 and FOR 837 had Northern Coachbuilders L55R bodies, and GAA 179/180/181 had Leyland H56R bodies. Interestingly, the fleet numbers LO52/3/4/5/6/8/9/60/1 were applied to these vehicles in sequence, which raises the question – what happened to number LO57? I remember seeing examples of the NCB highbridge PD1s in Fareham as a child in 1949 (though possibly it was always the same bus – a picture of FCG 523 on the Fareham service may be found in Alan Lambert’s definitive book on this operator, which is the source of much of my note here), when I assumed, as Basil Williams always intended the public to believe, that Hants and Sussex were another of the large territorial companies. I do not know what financial arrangement Mr. Williams entered into when purchasing these buses, but they all arrived new in 1947 and were all gone by 1949, several having been on loan to other operators within those two years. It seems very likely that the outturn finances of the Hants and Sussex group did not meet its proprietor’s optimistic expectations by 1949, and, indeed, the greater part of the business collapsed at the end of 1954. There are three good sources of information available on Hants and Sussex, Alan Lambert’s book, PSV Circle PK14, and Alan’s article in the 2009 issue of the Leyland Journal on the company’s post war Leyland double deckers. FCG 528 [LO57] was registered to Basil Williams personally, and thereby remained with him after the demise of the various limited companies in 1954/55. It was originally bought for the Midhurst group of routes, but after the "crash" it was used on the Thorney Island route. It was also used on the Sunday afternoon run to the Alton hospitals. It was sold for scrap in 1960 when the Tiger Cub, and Bedford SB1 were bought. Of the ten PDIs delivered new in 1947, seven with NCB and three with Leyland H56R bodies, this is the only one that remained in the personal ownership of Basil Williams. The other nine were sold elsewhere in 1949 after only two years with Hants and Sussex, well before the 1954 collapse of the group. It looks very proud, garlanded up for the 1953 Coronation. This is an old tradition which has sadly died out, too! You’re as bad a pendant as me, David. But even we pedants can slip up sometimes, as I did here! I should OF known better! FCG 523/4? I can come up with at least one subsequent owner, in some instances two, for all the other Hants & Sussex PD1s (except FCG 528, of course). FCG 524 was acquired 10/49 by the Griffin Motor Co, thence to Red & White and was disposed of in 1961. GAA 179-181 went to United Welsh in 1949 and also lasted until 1960/1. With absolutely NO knowledge pre-1970, the name of Basil Williams was still one that surfaced from time to time in our corridor of Southdown House, which we shared with Fares & Licensing. I recall that there was a bank of filing cabinets for all the companies Southdown dealt with on licensing matters – but Basil had a complete drawer to himself! Henry Frier, that Roger Cox mentions in the article on Bere Regis, sat just across the corridor from me. Did the notorious Basil continue post-1954 in another guise? There are at least two shots available of FCG 523, when with Stonier’s of Goldenhill. Yes, Nick. Basil most certainly did continue beyond his 1954 cataclysm. After one distressing experience in which the transfer of road service licences from an acquired operator to his own business was refused, Williams always retained the company names of acquired operators, resulting in a bewildering profusion of separate companies that collectively operated under the Hants and Sussex name. Some services, however, were licensed to Williams in his own name as sole proprietor, and were technically not a component of the Hants and Sussex group, although they operated under that banner. By the mid 1950s, rural bus services were in terminal decline, and independent operators who were largely dependent upon such mileage began to experience financial pressures. In December 1954 the company’s bank and other creditors, who collectively were owed some £74,000 (around £650,000 today) applied for the liquidation and asset sale of Hants and Sussex. The Midhurst area services personally licensed to B.S. Williams remained in operation under his control, together with the Blake’s Tours business at Plymouth. From this somewhat shaky basis he gradually built up an operation that, from 1962,he named Southern Motorways, based mainly at his Emsworth depot. The implementation of the NBC local companies MAP (Market Analysis Project) route economies saw Williams picking up work that NBC reduced or abandoned, a curious reversal of the 1940s/1950s scenario in which Aldershot & District, Southdown and London Transport had (in collaboration) fought every expansionist move by the former Hants and Sussex business. Basil kept going right up to the end until he sold his Southern Motorways operations to Solent Blue Line in late September 1987. He died during the 1990s. The definitive book on this fascinating operator is "Hants & Sussex" by Alan Lambert. On a personal note, when, on leaving school in 1960, I took up a clerical position with London Transport (Country Buses & Coaches) at Reigate, I discovered some pretty fat files on Hants and Sussex in the attic, and gleaned much from their perusal. Sadly, I didn’t make off with them, and they undoubtedly perished under subsequent "tidying up". Thanks for that, Roger. I’d forgotten the Southern Motorways name but, sitting in the next office to Southdown’s Fares and Licensing Officer, Len Cole, with paper thin walls, I heard a lot. Road service licensing was something of a minefield, took up loads of time and money, and ultimately showed that it could be done without. I recall sitting through two whole days of a Met enquiry, waiting to be called as a witness opposing an Asian application for a Southall – Smethwick service. The applicant suddenly said he’d moved his depot up the road and the whole process had to start again. Like you and LCBS, I wonder what happened to all those SMS files in the end? Roger, may I query the date you offer for Basil Williams’ sale of his operations, which you state to be September 1987 to Solent Blue Line? I have a note copied from Bus & Coach Preservation magazine April 2012 issue which shows the last bus to carry the Hants & Sussex name. This is a Leyland National AAE 653V, and it was pictured at Havant in 1997, "just after H&S sold out to Southampton City Bus, and not long before SCB became part of First Group". Also, in Buses magazine Jan 2002 issue, there was a fleet focus on Emsworth & District (founded 1977). This article states that E&D ran Hants & Sussex for a few weeks in 1998, but found it to be beyond saving. Another Bus & Coach Preservation magazine photo in March 2016 issue shows ex-London Transport AML605H, and the caption includes the note that this ran for Basil Williams’ Hants & Sussex in 1993-94, before going to scrap in 1994. Was there a slip of the finger (1987/1997) in your input, or is there another explanation? With the history of Basil Williams fleets, anything is possible! I agree that Alan Lambert’s book on H&S is a marvellous piece. Published in 1983, it would be great if someone could write and publish the remaining history from 1983 to the end, with all the developments during the deregulation era which would also be fascinating reading. The Williams family still own Glider & Blue Motor Services Limited although it hasn’t traded as an operator for many years. I think Basil Williams died in 1999. Michael and Nick, I yield entirely to your greater knowledge about the latter days of Southern Motorways. I haven’t ventured back to the Hampshire area from my East Anglian retreat for many years, and I can’t now recall where I acquired the idea that the end of Southern Motorways came about in the late ’80s. Thanks for the correction. There is a certain irony that the delightful Hollybank House boasts that all its rooms have flat screen TVs/DVDs, when one remembers that Basil Williams once claimed that Television was the single biggest cause of the collapse in bus use. My apologies to Richard Smith, I hadn’t realised that the Red & White fleet list was on his own website. In my contribution back on 01/09/17, I said it would be great if Alan Lambert and Sussex of 1983 could be updated. What do I find? In an e-mail bulletin from a publisher of transport books, there is just that book, by A Lambert! The brief review calls the author Adam Lambert, but from the script, it looks like it is Alan himself who has written this, and is published by Bowden Publishing at £40. Apparently there’s no fleet list, but I shall nevertheless be an eager purchaser as cash flow permits. So it’s good news that we will have the complete story to study and enjoy, and congratulations to author and publisher. Having sold a few vital organs to finance the purchase of Alan Lambert’s new book, I can say that it is well worth the cost. Hard backed, with over 200 pages, it contains the detailed history of around a dozen companies who formed the group together with details of their predecessors. I imagine that it has been a lifetimes work for Alan Lambert to write this book and I would say that it is a job well done. I’ve just ploughed my way through Alan Lambert’s tome on Hants & Sussex, and it really is riveting read: it’s the financial side of things which I found interesting – hardly any part of the group made a profit and the whole organisation seemed to be kept afloat on a raft of bank loans, personal loans from Basil, and loans between companies. My understanding was that the group was sunk by a combination of interest charges on new vehicles at a time when passenger numbers started to fall and fuel duty rose sharply – but truth seemed to be that he kept on buying "pig-in-a-poke" companies from all-too-willing sellers, and then wasted money in battles in the Traffic Courts and appeals to the Ministry in an effort to expand their licenses. Even if you’re not particularly interested in H&S or bus operations in that area, it really is a fantastic read: I must admit though that I found keeping a copy of Alan’s earlier work close to hand quite useful – because of the amount of detail the latest book treats each strand of the business separately, and its useful to have the chronological text of the earlier book available to be able keep happenings within the perspective of the rest of the group. Phiip, my reactions on reading Alan Lambert’s new volume mirror yours exactly. To your list of curious "business decisions" may be added Basil’s over eagerness to grab wartime and postwar contract work seemingly without any concept whatsoever of costing, so that massive contracts requiring much hiring in from other operators, who assuredly got their pound of flesh, ended up earning him little more than pocket money. The Hants & Sussex conglomerate was a classic example of a precarious business run by the seat of the pants, totally lacking any proper commercial costing system. In 1988, after leaving Kentish Bus when Proudmutual (aka Northumbria) got its paws on it, I was asked to undertake a survey of the Southern Motorways Midhurst operations. I found these to be of decidedly marginal value and made a number of recommendations, all of which were subsequently ignored. Right through from 1937 to the end the B.S. Williams saga was one of extreme financial fragility, yet the proprietor continued to plough his lonely furrow regardless of reality. Am I alone in seeing a parallel between Basil Williams and Colonel Stephens of light railway fame. Malcolm. Ref your mention of Col Stephens I can claim no knowledge of Basil Williams other than what I have read in this thread. From that limited base I would say the two are worlds apart. Stephens knew the value of everything to the last penny and never spent a penny where a ha’penny would do. By dint of very strict financial control, he ran his empire of very marginal railways for around 30 years and noticeably, once he was gone, the empire disintegrated, which is not to say that it would not have done had he still been there. I can’t imagine any undertaking run by Holman Fred Stephens buying 8 brand new double deckers – it would have been 20 year old TD5s or surplus trolleybus bodies fitted to old chassis like Silcox did. I can’t imagine him going for expansion at all cost without having a very good idea of the costs and likely income to be had or quoting for work without knowing the costs to the last penny. I wasn’t referring to business sense but more the general penury of running a widespread operation with no money. Also common to both is the attempt to continue to operate when any sensible person would have thrown in the towel considerably earlier.